0-liner non-paraglider glider has no tethers to any bridling point; such gliders are not paragliders. airframed. Such gliding kite systems have a large sport paragliding presence. union point to resistive set. 1-liner paraglider is a two-riser system; the "1" refers to level of line starts at the riser at the payload or resistive set. The many kite lines (playing up to three roles of wing shaper, wing-shape controller, and kiting). A-frame in hang gliders: W. Simon A-frame in hang gliding; triangle control frame in hang gliders. Exhibited at meet in Breslau in 1908. ACE airworthiness, (low) cost, effectiveness ds, Dec. 2010. ACE AWECS. accident Low-consequence kite accident. High-consequence kite accident. stands for "Ace Comp Pilot"...a tongue in﻿ cheek title that has been applied to the "comp scene" in hang-gliding. It's all in good fun! active air Air that has robust helicities occurring. Thermic conditions, obstacles, industry, vehicles, machines, other aircraft, birds, trees, wind turbines, kites, ground formations, buildings, combinations of things, etc. are among some of the sources resulting in helicities that sum to active air. Active air is a normal characteristic of the atmosphere. Natural creatures have evolved to survive unique levels of strength of active air and to avoid the levels that exceed that strength. Humans, relatively new to flight, continue to struggle to recognize what levels of strength not to exceed with their various flying devices. A property of a moving fluid which represents the potential for helical flow (i.e. flow which follows the pattern of a corkscrew) to evolve. Helicity is proportional to the strength of the flow, the amount of vertical wind shear, and the amount of turning in the flow (i.e. vorticity). Atmospheric helicity is computed from the vertical wind profile in the lower part of the atmosphere (usually from the surface up to 3 km), and is measured relative to storm motion. Higher values of helicity (generally, around 150 m2/s2 or more) favor the development of mid-level rotation (i.e. mesocyclones). Extreme values can exceed 600 m2/s2. Active-Tether AWECS See also types of active tethers. See Dave Santos wing-mill which is an active-tether AWECS element type. advertising Kite advertising. AWECS advertising. Advertising in the AWE world has many sectors and aspects. The shape of a wing may express message itself that could forward an entity's purposes. The symbols or text on a lifted wing could forward someone's aims. Shape and message on tether hazard warning flags/socks could hold advertising. The ground station of an AWECS could hold advertising messages. Stakeholders in AWE community may advertising their services and products in EnergyKiteSystems.net for a reasonable fee. Kites may be used as they have been for centuries to carry messages seen in the sky as well as drop leaflets. Some dropped leaflets may be in good aspect ratio rectangular format to give significant rotary Savonius flight for visual impact and spread effect. Advertising in AWECS may be self-serving or serving of the needs of third parties. aeolian generator, trospospheric aeolian generator That is, kite systems with a focus on generating special forms of energy for use in practical loads. aeolian parks Term used in patent applicaition. aeolic wiki See also eolic. Early artists depicted aerial habitation aerial floors. Constructing surfaces in the sky by aviation tactics produces activity flooring. From aero floors: drop net curtains for various purposes: huge net cages to hold insects, birds, test aircraft, enemy aircraft, flying fluff, explosive debris, etc. aerial application industry, aerial application pilot. Consider kite systems working to do aerial application. Aerial application pilots may affected by the presence of AWES. See concern by National Agricultural Aviation Association (NAAA) in comment to FAA in Feb. 2012. The AEA organisation disbanded on 31 March 1909.
aerial rules See airspace regulations. US Pat. 7188808 Gaylord G. Olson "aeriawind power generation" using a "support body"
aerie Nest of eagle. Nest for a downed AWES. aerodrome has various meanings "air-runner" ...note in 1897 of The Aeronautical Journal; the machine runs faster on the surface of the air than horses run. This is Woglom's spelling in his book Parakites. 1896. Full book is freely available online. AeroFlyer (related to Air Force Flight Dynamics) Report: http://www.dtic.mil/dtic/tr/fulltext/u2/a056569.pdf (bak) Flight test results of a powered parafoil system (Aeroflyer). TR AFFDL-TR-76-15 Final Reoprt for period September 1973-December 1975 Author: John D. Nicolaides of A-E-R-O. [ Dr. John D. Nicolaides, Chairman of the. Aero-Space Engineering Department, University of Notre Dame. Out of print: Parafoil flight performance. Book. Air Force Flight Dynamics Laboratory, Air Force Systems Command, 1972 - 101 pages. Parafoil Wind Tunnel Tests. Air Force Flight Dynamics Laboratory, Air Force Systems Command, 1971 - 368 pages. Para-Foil Design: ND 1.5 University of Notre Dame, 1966 - 6 pages. N3029 was one of the trikes for the parafoil experiments. aerofoil upright The triangle control frame's two legs are sometimes called uprights, downtubes, queenposts, legs. compression rigging tube. When that beam is with a streamlined shaped cross section, then some refer to the beam as an "aerofoil upright" or "aerofoiled upright" or the terms use "airfoil" or "airfoiled" for the spelling. 1975, July: Manalis, M.S., “Airborne Windmills: Energy Source for Communication Aerostats,” AIAA Lighter Than Air Technology Conference, AIAA Paper 75-923, July 1975. "AEROGRAPHITE - had been invented at the TUHH in strong cooperation with our partners of the Institute for Functional Nanomaterials at the University Kiel. Aerographite synthesis, refinement/development, structural characterization, mechanical testing and investigation of its functional properties are realized at TUHH and CAU Kiel." ISO Efficient thermal insulation for the use in aerospace and tensile architecture. Barriere Ultra light, helium tight envelope material with excellent weldability. aerogel wiki Notice that there are aerogels based on other than silica. And consider also vacugel and also a futurism of 3-D nano matrices of super-low density, perhaps even lighter-than-air formats without enclosing light-than-air gases ... Consider nanofoam and evacuated versions of aerogels, etc. Dream of solid kite wings that are lighter-than-air that do not use lighter-than-air gases ... Some dreaming. aerohydrofoil Defined by Bernard Smith in 1963 in book on page 3, The 40-Knot Sailboat. AeroKite™ Aero Kite Aerokite One instance is a Savonius winged airplane-mimic kite; the kite converts some of the wind's energy to sound, lift, and drag. The sound in a toy version enhances the mimic of powered-aircraft sounds. http://www.aerokite.ca/ Aerokite™ Toy Company Perhaps micro generator charging tiny ultracap that releases occasional pulse to light a LED for sparky evening flight? AeroKite is a term being used in a forum KiteGen in a thread of messages that wrestles with the two-kite free-flight new aviation systems where no tether reaches the ground. Some concepts mine energy during the dynamic soaring. See FFAWE. Aeronautical Annual, The Aeronautical Annual, annuals ? The Aeronautical Annual. 1895, No. 1 and No. 2 of 1896 and No. 3 of 1897 combined in free ebook..
1896, No. 2. "Where on the hanger is the proper point to tie on the guy line?" Aeronautical Annual, 1896, edited by James Means. Full free ebook online. Aérostiers, Aerostiers =operators of earlier French balloons, late 1700s. Also see in year 1891 in primary batteries for air voltaic batteries. Book: Primary Batteries by Henry S. Carhart, A.M., professor of physics in the University of Michigan. Page 23: "The relation of the air voltaic battery to the liquid voltaic battery may be illustrated in a different way." A-frame and U-frame and Parallel-frame. Infinite zenithal A-frame. Infinite Apex-al A-frame (Steve Seibel). Practically it is almost impossible for have two beams parallel; microscopically teh two beams will vibrate to be skewed in space. When two side beams are joined to a base beam's ends, and then joined at a apex of a triangle, then we have a firm A-frame. Else, if the two up-going beams are not joined directly, then they are likely to be skewed in space and almost never be parallel, but momentarily. But assuming the side tubes are fixed on the same plane, then if one attempts to have the beams parallel on that plane, then the two tubes will rise to form a U or rise to form at a point of infinity an apex to the triangle; hence Steve Seibel of Aeroexperiments spawned the term "infinite apex-al A-frame. Faust had the term "infinite zenithal A-frame" from visualizing the zenith as the meeting point of two parallels; the zenith point would be the apex. In real builds of biplane hang gliders, sometimes the builder has two symmetrical up-going beams from the lower-wings's spar; those two beams might deliberately be slanted toward each other or set as parallel as the designer could make them, perhaps specifying that the beams be parallel. But in material fact, even if the specifications call for parallel, the two beams will almost all the time live their lives non-parallel while going into skew configuration; again if one then assumes same plane, then also assume fixed position, then the zenith point may be considered as the apex of the A-frame, or the top of the "A" of the craft. for for hang gliders to a flexible wing hang glider with pilot hung from keel behind the A-frame or cable-stayed control bar was exampled in a gliding club in 1908 in the territory of Breslau. Photograph of the demonstration is in Stephan Nitsch collection. That and the Flight magazine of 1910 feature on the control system involved with the triangle control frame formed part of the inspiration for others to use the system; indeed the basic TCF was involved in one way or another in almost all aircraft as it morphed in various ways as an undercarriage, holder of engines and motors, springs, skids, etc. Igor Bensen used the hung pilot behind a small triangle control frame or A-frame in his early 1950s kite-glider. Later users in the 1960s included Barry Hill Palmer, Mike Burns, and then John Dickenson and others. Thanks to the pioneers pre-1911, including Beeson, Pilcher, Wenham and others who gave the foundations for the A-frame control system most simplified by the Breslau 1908 exampling. 1905 patent filing by Gustave Whitehead had control frame with infinite zenithal A-frame in front of the pilot in flexible-wing hang glider. 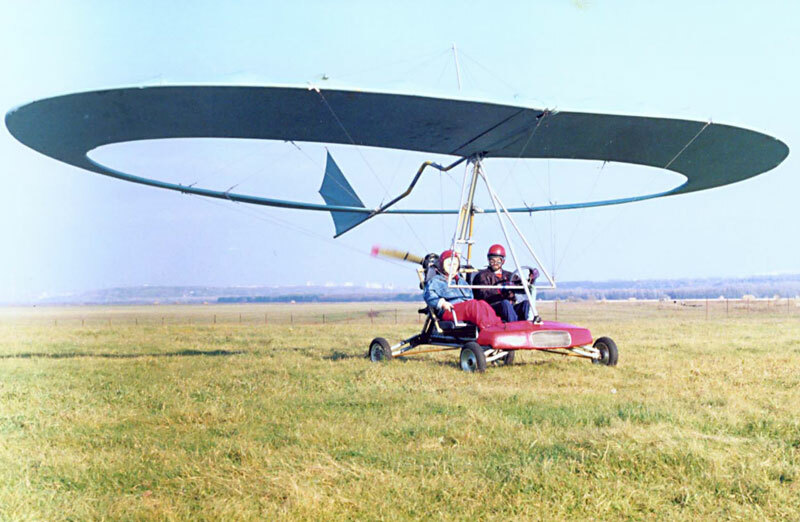 In 1908 in Breslau in gliding club meet, a battened flexible wing footlaunch hang glider featured the A-frame cable-stayed with pilot hung from keel, one of the many early uses of what is so common today in ultralights and hang gliders. In 1910 in the classic book on model airplanes had many examples of the use of the A-frame for landing skis and wheels, even cable-stayed beneath parasol wings. illustrated with many photographs and diagrams by the author. Main Author: Collins, Francis Arnold, 1873- English New York : The Century co., 1910. Discuss any point that you see as interfacing with hang gliders? Aggregate Flight Stability- The effect of increased flight stability exhibited by linked arrays of less stable AWECS sub-elements. air AirCarAccess Emergency air. Underwater air. An elemental kite is sometimes seen as an air anchor for what is occurring at the other end of the tether. 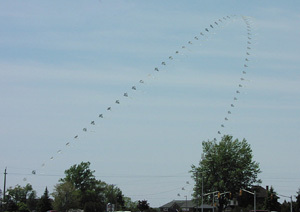 A soil anchor or water anchor to a kite system may be made using a air-filled balloon to give volume and bite. Thus air-filled anchor or air anchor. In a FF-AWE system each tether-terminal wing set is a relative air anchor to the other opposing tether-terminal wing set. airborne kite control Control a kite system passively or actively by devices lofted. Control may be smart and automatic in response to sensors. Control might be by expert programs in a ground-based command center, perhaps manned. Control might be by a person also lofted with or without additional device; that is, perhaps the human is the airborne kite control like in gliding kites (paragliders). The lofted human might have additional devices and information input to be part of the control system. Take a 2 MW single-tether kiteplane (like Joby's model) operating under a 2000 ft ceiling. To keep safely clear of neighbors it occupies a circular plot near a mile across. Presume a 3x3 array of nine kiteplanes for 18 MW from a 3 mile square kitefarm. The same land developed with conventional 5 MW HAWTs, spaced normally, could develop greater than 100 MW, presuming that better wind capacity-factor aloft roughly offsets the lowered system availability of complex delicate aircraft. Conventional HAWTs win overwhelmingly in raw land efficiency without even touching the upper-wind. However, the same land and airspace that the nine kiteplanes sparsely occupy can be densely packed with airborne turbines or wingmills, in string latticework based on classic kite methods, for over a rated gigawatt. AWE arrays of cross-linked semi-captive elements seem to have a fantastic advantage in space-efficiency, not just safety and control, over single-tether designs. airborne turbine AT There are a great variety of turbines that operate up in the air. RATs are part of the variety. Turbines lifted by kites or balloons or kytoons are also airborne. Airborne Wind Energy ... hub for earth's AWE. Airborne Wind Energy Conference 2010 http://www.awec2010.com/ sponsored by Airborne Wind Energy Consortium and NASA. Airborne Wind Energy Consortium The USA-focused 2010 result from Joby Energy, Makani Power, Magenn Power, and Sky Windpower. For international consortium of AWECS business: see KiteLab Group which has been the first business consortium. Airborne Wind Energy Industry Association AWEIA international, all-AWE scales, all nations, non-military, first-in-service for transnational AWE services. airborne wind energy technology The phrase adopted for communicating the sector of renewable and sustainable green energy using tethered and free-flight devices to convert the kinetic energy of the wind to useful works. Airborne Wind (Kite) Energy is a phrase used occasionally. airborne wind startup A young AWECS company. Air energy transfer (see Alexander Bolonkin paper of 2003. High Efficiency Transfer of Mechanical Energy, Alexander Bolonkin. Using cables lofted in the air to transfer mechanical energy; the use of control wings (kite systems) for the systems is involved. airKite, air kite, kite. See for water foils: hydrofoil, waterKite, hapa, paravane. Air Rotor System Magenn Power Air Rotor System (M.A.R.S), M.A.R.S. AirSpace Infill Factor -The effective density of AWECS elements in a given airspace. air speed airspeed wiki In Lindbergh's Spirit of St. Louis, the meter had the two-word version "Air Speed". For measurement of airspeed, see anemometry and anemometers. Airtricity One type of airtricity is kitricity. Another type of airtricity is electricity obtained from ground-hugging wind turbines. Another comes form atmospheric electricity mined in several ways. Kite energy systems that produce electricity (kitricity) are kitricity production systems. ALPA ALPA is the largest non-governmental aviation safety organization in the world. The Association's founders chose "Schedule with Safety" as their motto in 1931, and that theme remains central to the union's work today. altitude wind energy Distinguish between wind-energy conversion systems that are towered at high altitude site from tethered for free-flight wind energy systems that have working parts flying at high altitude in upper wind for upper windpower. Wind energy captured by kite systems (including LTA kites) and put to task are occasionally referred to as altitude wind energy systems or AWES. The tethered systems with wings are airborne wind energy systems or AWES. altitude sweet spot for an AWE working system. More: working file. Surface Layer- A turbulent wind zone typically extending 50-75 ft above ground surface. Visibility Ceiling- The altitude at which clouds or fog begin to hide a kite. Control-Line Ceiling- The line length/altitude at which control becomes excessively sluggish. Flight Ceiling- Maximum altitude allowable by regulations or conditions. Preferred Altitude- The best flight altitude given conditions (Altitude Sweet Spot). American Wind Power Center and Museum in Lubbock, Texas. The center in August, 2012 has agreed to begin collecting AWES. Visited in August 2012 by the traveling Mothra1 team supported in part by Util, LLC. http://www.amsteelblue.com/ [[comes in more than one color]] "super strong, high-modulus polyethylene fibre"
Note: Kite systems anchors come in great variety. Essentially a kite has a "resistive sector" (anchor) that can be fixed or moving to various reference frames. The resistive sector could be a hand of a human, a tree, a moving vehicle, a parachute, a kite, a rocket, a raft floating in a river, a fuzzy tether that develops tether drag in a different strata of air or perhaps water or moving lava, etc. The resistive aspect permit the tether set to bridle the other end of the tether set where a wing or set of wings react with streams of fluid or matter or plasma to fulfill the kiting principle. Many AWES may use deep-set low-mass soil anchors without need for concrete. Analysis of a kite anemometer by Huang, K. H.; Shieh, C. F.; Frost, W.; abstract only linked. Evaluation of a Tethered Kite Anemometer Kunkel, K.E., 1981: Evaluation of a Tethered Kite Anemometer. U.S. Army Atmospheric Sciences Laboratory Report AFL-TR-0076. Studies, notes, papers towards robust view of "kite as anemometer" could follow in this topic thread. Realtime strong view of wind speed and direction at all altitudes from wing altitude to mooring regardless of length and inclination of tether segments might provide data for AWECS farm management. Additional note: Branched kites with branched tensions; tensions of each branch reported? angle of attack Change AoA during kite energy generation. wx = P, wy = Q, wz = R.
Coordinates and rotation sets P,Q,R = roll, pitch, and yaw angular velocities [s−1], with the agreement that (x,y,z) = (roll axis, pitch axis, yaw axis)=(tail to nose fuselage axis, center to right wing tip axis, center to down normal to roll and pitch axes) under right hand directioning. Note: Avoid being confused by geometric lettering. Convention has it: P for the roll. Q for the pitch. R for the yaw. Roger G4ROJ Since 1970s he has been practicing arts of lifting aerials by kite systems. arch of trains A kite system that is an arch kite with its wing-segment elements as trains of wings. arch kite See also kite arch and playsail for more. See flying fences. "kite arch" | "arch kite"
arch of trains :: Consider a system that has two anchors spread far left and right of the power window; the arch is maintained by a series of elements where each element is not just one wing, but a train of kite wings; the whole is a series of trains that lift an arch. Kites used in archaeology. Here a conventional archaeologist uses kite systems to study land formations and patterns; KAP for archaeological sites. Patron saint for archeologists: St. Helen or St. Helena, finder of the True Cross. Consider having her as a patroness for kite researchers, since the cross is so much a part of low-mass kite construction; begin with Malay and Eddy, etc. Companion along the way of digging for information about kites. For the Christian, let the cross remind of the bridge to heaven: Christ's Body covering contradiction (cross) for redemption; ascension and soaring with lightness and joy. Kite archaeologist is one who mines earth and culture for kites and kiting. Kite researcher. Seek the true essence of "kite." Areal velocity wiki A wing might sweep an area of a square kilometer at a slow rate or at a faster rate. If it takes an hour to sweep 100 m2 by a wing, then that is much different situation than if the wing swept that same area in one second. WSIKF_2010_mega_fly_card_front__73506_zoom.jpg Individual anchors, individual tethers. Sky plane (planar display). One wing per tether-anchor. arresting gear 1wiki Momentary kiting of landing aircraft. arresting nets Nets may be kite-system held aloft or near ground; such nets may be used to arrest aircraft or free-falling humans. Arresting nets held and moved by kite systems may catch birds, enemy aircraft, fog-water, particulates, fugitive kites, fugitive AWESs. ARTAG, ARTAGs Autonomous Reciprocating Tethered Airfoil Generators Discussion in 2003 by Kiteguy of Newburg, Oregon; Wayne German. Single ARTAGs, Double ARTAGs, Triangle ARTAGs, and Arch ARTAGs. ascender (rope climbing device) wiki jumar An AWECS worker might be using ascenders during operations or maintenance service. ascensional current "A. Lawrence Rotch, Director of the Blue Hill Observatory, in the Aeronautical Annual for 1896, observes: "...kites have demonstrated the existence of strong ascensional currents," and on the same page (109)," from Woglom's book Parakites, page 22.
asperities Regardless of how smooth a surface may appear, it has many small irregularities called asperities. wiki KES that involve rotating parts' bearings will face the challenge of asperities. US674427 Apparatus for collecting atmospheric electricity Filed: Jul 10, 1900. US911260 Filed Jun 26, 1907. Apparatus for collecting atmospheric electricity. US1014719 Filed: Jan 4, 1911. Apparatus for collecting electrical energy. Atmostat An atmosat is an artificial body maintaining a persistent state within the atmosphere of the earth or another planet in order to collect information for communication. Think of Kitesat as an atmostat. autonomous kite systems of fantasy These science-fiction kites self-replicate, self-repair, self-launch, self-pause their flight, self-re-launch; they might perform special works. These kites are fully apart from human interventions, even though they may have received origination from human actions. Some of these kites will be gathering energy from wind for use in their own welfare and operations as well as the needs of other entities, perhaps human. Hopefully these kite systems favor the life of humans and animals. They sculpt themselves to be successful in their environments, so they do not cease to be a kind. Let us note that "AutoRotation" applies to all passive flow-driven rotation, from HAWTs and gyrocopters, to looping parafoils, gyrokites, unpowered bladed turbines, spinners (air or water). The current article in Wikipedia has severe errors in its title. Automotor Journal, The Automotor Journal "Since early in the decade, British weekly The Automotor Journal had been tracking aviation developments under the label Aeronautics" Google Books has digitized some of the journal. Ultimately FLIGHT followed from the company for the aeronautics concerns, beginning in Jan. 2, 1909. Will passively-controlled AWES be "unmanned vehicle system? Aviation and aeronautical engineering, Volume 1. August 1, 1916 Semi-monthly. = Integrating AWE with established airspace users. AWE "advise when established" http://chihchin.myweb.hinet.net/Data/united_states_of_america.htm Air traffic control usage. AWE American West Airlines ICAO code. The ICAO airline designator is a code assigned by the International Civil Aviation Organization (ICAO). AWEA American Wind Energy Association Distinguish from AWEIA for AWES industry. AWE advertising See advertising for full discourse on many dimensions and aspects. Discuss each AWE book: HERE. AWE beating the HAWT Issue: When AWE systems show an economic profile more interesting than the horizontal axis wind turbine on hard towers, then AWE will be widely embraced. The ETA for wide acceptance of AWE beating HAWT is __________________. AWEC airborne wind energy converter Devices that are airborne and convert wind energy to work or to other forms of energy like electricity. A wide variety of AWE methods are being identified for low-altitude airborne wind-energy capture. Tethering between mountains, buildings, aerostats, kytoons, etc. at low-altitude mine messy winds, Venturi sites, artificial streams, high-coordination with water flows, etc. 2. whether or not the system is an "ever-up" or a system that frequently collapses into a non-working phase. Control further affects design: active control (robotic or human or combination) or passive control. Additionally, size or scale matters. Specific application and budget drive final design of AWECS. Amplified Wave Energy Converter System (AWECS), (Patent Applied For). AWECS uses ocean wave energy to safely, reliably and inexpensively desalinate and purify saline water initially and later to provide a new source of renewable energy to our waiting Planet. Free-Flight, national, utility, commercial, residential, nomadic, sport, toy, miniature, micro These ten scales over-lap and feed solutions into other scales. free-flightAWE, nationalAWE, utilityAWE, commercialAWE, residentialAWE, nomadicAWE, sportAWE, toyAWE, miniatureAWE or miniAWE, microAWE. At each scale there are inventors, designers, technicians, and users, sometimes with overlapping interests and applications. A very large amount of development remains to be accomplished. AWECS plans Full plans with specifications for an AWECS distributed on the Internet for a toyAWE system, for a sportAWE system, for a nomadicAWE system, etc. will occur. We hope the plans have been made from a fully-working safe system. AWE Documentary, awedocumentary.org AWE, the movie. AWE glue: JoeF, says Wayne German, 18Jan2012. AWEIA, Airborne Wind Energy Industry Association (global org ). Mission statement. Collective IP. Cooperative R&D. Lobby. Cooperation. Representation. Assistance to start-ups. Founders. First directors. First officers. First members. Calendar. Historian. Members. Officers. Bylaws. Incorporation. Directors. CFO. Treasurer. Secretary. President. Member benefits. Honorary fellows nominated so far: Wayne German, David H. Shepard, John Etzler. Meetings. Minutes. Voting. Newsletter. Editor. Logo. Membership categories. Assets. Liabilities. Tax reports. Income. Expenses. Passkeys. Records site. Staff. Contracts. Look at a tech matter and wonder if that matter could play a part in energy kite systems or airborne wind energy systems; that wondering is about integrating a subject tech into AWE or AWECS. Verb: "AWEify" . Ask about any tech: Can that be AWEified? M3295 AWEifications is a noun form. AWEified is an adjective form. AWEifying is a gerund form. AWE jobs AWES Jobs Jobs and opportunities in AWE industry. AWE-lympics showcase various methods and sizes of AWECS? AWE Pilot Union (proposed by DaveS on Dec. 23, 2011. AWES5173 "My ambition is to be a gigawatt-scale kite-farm pilot, and in my mind the union is already in existence, as a natural extension of ALPA, the historic model, ..."
The AWE Race is on .... What are some of the aspects of the AWE Race? PR, merit, IP, airspace governance, fly-off competitions, Notes are welcome. = An "AWES" is a airborne system that interacts with the wind with the result that the wind is slowed while the AWES converts some of the wind's kinetic energy to other forms of energy (kinetic energy of AWES parts, potential energy of AWES parts, heat of AWES parts, for example; AWES never "create" energy, as that would counter the law of conservation of energy. The AWES energies often do works in the AWES itself and while so working effect changes in the wind and other parts of the environment that may be connected to the AWES. When the AWES is a kite system, then the energies gained from conversions of the wind's kinetic energy may work to alter the anchor systems. AWES may fulfill practical needs and tasks; "practical" could be subjective; "need" could be subjective. == Various people look to AWES' converted energy to fulfill their particular needs and objectives that well may differ from the needs and objectives of other users of the energies involved. High emphasis on "fulfilling needs and tasks" by use of AWES is forming an era "K3" for kiting, though there are some AWES that are not kites. 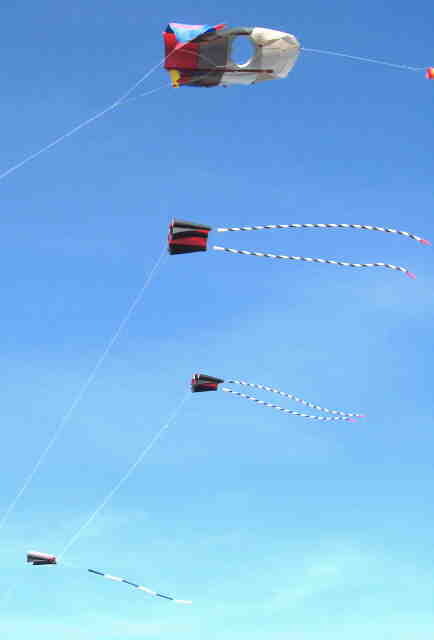 Every flying kite system is an AWES as such systems convert some of the wind's energy and then uses some of such energy to do work; momentarily some of the energy is placed as potential energy like in the kept altitude of the mass of the kite system's masses, or in the kept stretch of the elastic portions of the parts of the system. Some people are wanting to build into the kite systems parts that focus on converting the gained energy into noise more than would be common, or into light more than would be common, or gross mass motion more than would be common, or electricity more than would be common, etc. === Some tasks are seemingly more popular than others, but such does not invalidate niche applications that may not be so popular. === Some tasks involve the holding of parts in the kite system that generate electricity at a robust level more than occurs without attention to have special parts like highly evolved electric generators; such electric generators may be integrated into aloft parts of the kite system or in the resistive anchor parts of the kite system. When such highly advanced electric generators are integrated in a complex kite system, then the wind's energy converted by the kite system is channeled by design to drive the electric generator; such channeled energy is not then available to the kite system to do other works that might otherwise occur. Energy is not created, but only conserved in various ways. This sector of AWE is receiving investment funds from robust sources, partly with the hope in mind that AWES of this sector might go a good distance in reducing the need for fossil fuels in the world. === Another highly popular task is "pulling things" where things are other than the pulling around the shaft of an electric generator, but rather like pulling a boat, kiteboarder, plow, ground scraper, cart, etc. These AWES specialize in channeling energy converter from the wind into overcoming the friction and resistance of objects to be moved about the sky or ground or water. The pulled objects move and the energy is found converted into other forms like potential energy, heat of friction, turbulence of waters, kinetic energy of the moved masses, etc. Some of such "pulling" and generation of heat occurs even in the most simple kite. Cargo ships are being pulled; such replaces some use of fossil fuels. Kiteboarders are being pulled about by AWES; and when such activity replaces such activity as racing fossil-fuel vehicles, then some headway seems to be made to reduce use of fossil fuels. Discuss aspects in the forum. AWES Museum is in an embryonic stage without open hours. Direct visits are not permitted; some items are shown in visits at exterior venues. Los Angeles, California. Founded by K.I.T.E.S.A. Holdings are objects, papers, books, and digital records. Stewardship of most of the matter is by EnergyKiteSystems and shared to the world online. Others may enter items for the collection by e-mail or URL reference or by postal mail arranged with the curator. AWE is a branch of aviation for the purpose of wind energy. AWE system as tower This is an issue in AWE industry. AWT airborne wind turbine Also, some are using same for a different focus, more refined: Aerostat Wind Turbine. Notice that a powered aircraft can put into stream a device that is a wind turbine for various reasons; such device would be airborne and a wind turbine, perhaps used for a sensing instrument or charging a glider's batteries or for cooling. See also: TAWT for tethered airborne wind turbine, or for another focus: tethered aircraft wind turbine; and differently for another focus for tethered aerostat wind turbine. axial flow propeller turbine HAWT Should be axial-flow blade turbine if open to the flow without duct. Else, if ducted: axial-flow impeller turbine. Early tech for water, air, display. Many patents show multiple rotors on a common axis. "axial multi-rotor ", multiple turbine rotors on a common axis.